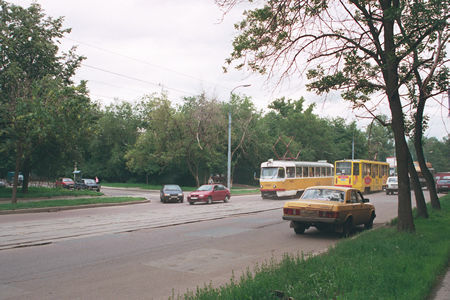 A tramline in Ordzhonikidze Street (former 5th Donskoy Proezd) was constructed in mid-1930's as a new link from Kaluzhskaya Zastava Square to a tramline in Shabolovka Street. 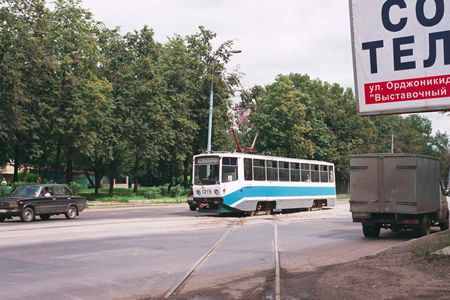 Years later, tram rails disappeared from Kaluzhskaya Zastava which became an official city entrance from Leninskiy Prospekt; but instead a new line along Vavilova Street connected Ordzhonikidze Street with the Moscow University district. 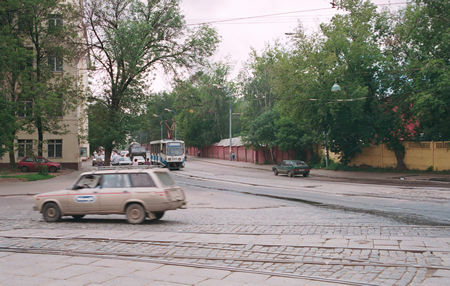 Ordzhonikidze Street begins here, from crossing of Shabolovka Street and Serpukhovskiy Val Street. An ancient Donskoye Cemetery is beyond this red wall, and the famous Donskoy Monastery is just a hundred metres from here to the left. The monastery once was one of a few fortresses that shielded Moscow from the south against the attacks of various invaders that raided Russian principalities a thousand years ago. The street, although located in the centre of old industrial district, is rather green. Small public parks replaced old buildings in 1960's. Unfortunately, the trees suffer from salt vapours and there one can see more and more bare branches. A former railway branch crosses the street and tram tracks. 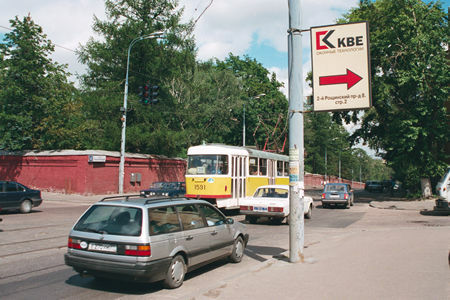 The branch was not operating for some years, rails on both sides of the road were removed in 1999. And finally, in August 2000 all traces of railway disappeared. I was successful to catch the last days of this crossing.